A family gathering in 1925 is the scene of this image. The adults from left to right are Eda Witt Lucas, Cecelia Witt Morris, Leo N. Lucas, Joseph Witt, Helen Bixler Witt, Francis Witt, Blanche Witt, Mary Governor Witt, and Alvy Thomas Witt. The children in the front are William Witt, Francis Witt, Jr., and Governor Witt. I’m unsure of the location, as the Witts, Lucas’ and Morris’ lived on Grant and Arlington Streets, two parallel blocks between Ford Avenue and Belmont Avenue in the 1920s. That area of Youngstown would have been relatively well developed, being so close to downtown. It’s not impossible to say that this was one of their homes, but the undeveloped land in the background gives me pause. 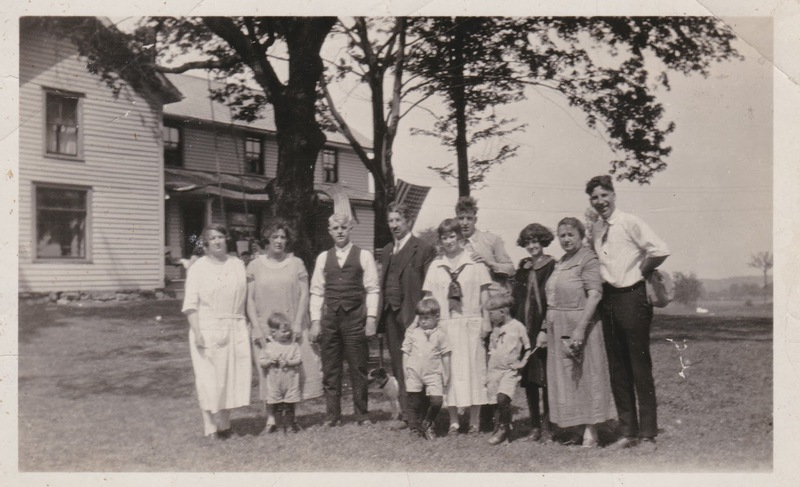 Eda Witt Lucas, Cecelia Witt Morris, Leo N. Lucas, Joseph Witt, Helen Bixler Witt, Francis Witt, Blanche Witt, Mary Governor Witt, and Alvy Thomas Witt. The children in the front are William Witt, Francis Witt, Jr., and Governor Witt. Copy of original photograph, original taken in Ohio in 1925; image taken by unknown photographer; privately held by Joseph Lowry, [address for private use], Sterling, VA. Provenance is Mary Catherine Witt Sanders to Joseph Lowry. This photo was taken around 1925. 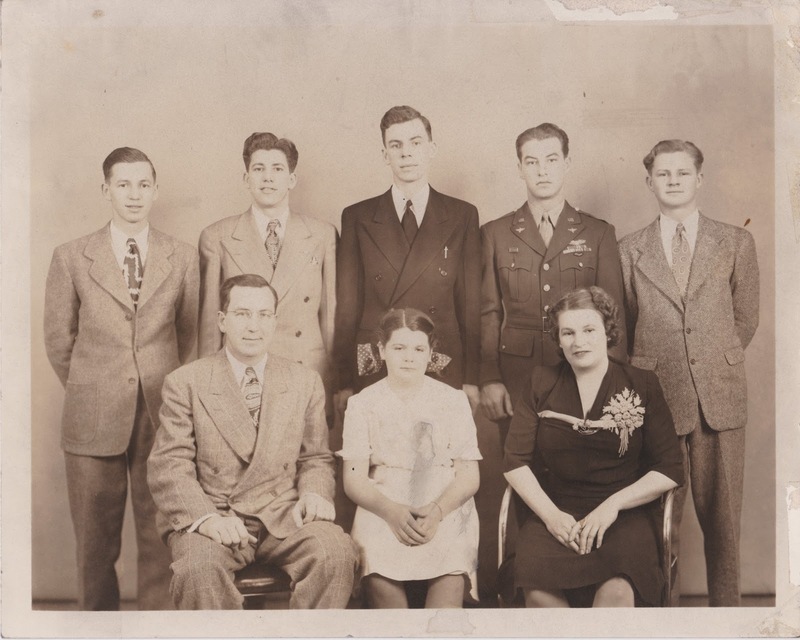 The older girl in the center is Blanche Witt, my 1st cousin 2x removed (also known as my grandfather’s first cousin) and she’s holding Fred Witt, my great uncle. My great uncle Francis Witt Jr. and Dorothy Leffler are the two others, according the image caption. I’m not certain who Dorothy Leffler is. I’ve located a girl I believe to be her in the 1930 Census, but could not locate a marriage record for her mother to confirm anything more. I also didn’t put much effort into it, so there’s that too. 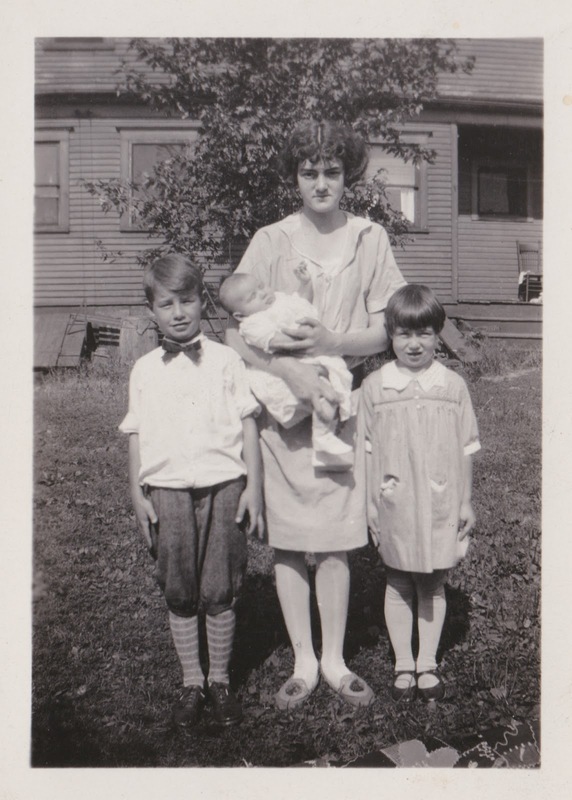 Blanche Witt (1912 – 1978), Frederick Witt (1924-2009), Francis Witt, Jr. (1920-2002) and Dorothy Leffler (unknown), photograph, taken in Youngstown, Ohio around 1925; image taken by unknown photographer; privately held by Joseph Lowry, [address for private use], Sterling, VA. Provenance is Mary Catherine Witt Sanders to Joseph Lowry. It’s been some time since I posted to the blog. The summer was pretty hectic, with little to no vacation, new responsibilities as the webmaster of the Fairfax Genealogical Society, and working with Eileen to get our townhouse on the market. In that space though, I was gifted a few dozen Witt family photos from Mary Catherine Sanders. She is my grandfather Howard Witt’s first cousin but has affectionately been called ‘Aunt’ Mary Catherine by my parents, aunts/uncles and cousins. Mary Catherine and her son Matt (aka the Mad Vintner) have long been interested in genealogy and have been great resources on my Witt ancestors. I consider myself fortunate to receive these photos of my grandfather’s family and will be working hard to get them on the blog in the coming weeks. I will start with this first image of my grandfather’s family in late 1941 or early 1942, perhaps taken on the occasion of my great uncle Francis finishing flight training in anticipation of being deployed to Europe. This formal portrait starts in the front row with my great grandfather Francis (1899 – 1992), my great aunt Helen K. (1934 – 2009), and my great grandmother Helen M. Bixler (1898 – 1985). The back row includes my great uncles Fred (1924 – 2009), Governor (1919 – 2004), William (1922 – 2011), Francis Jr. (1920 – 2002), and my grandfather Howard (1929 – 2001). Francis J. Witt (1899 – 1992) and family, photograph, taken in Youngstown, Ohio in late 1941 or ealy 1942; image taken by unknown photographer; privately held by Joseph Lowry, [address for private use], Sterling, VA. Provenance is Mary Catherine Witt Sanders to Joseph Lowry. Each Saturday I look forward to reading an article that former Youngstown resident Bob Trube writes on his website “Bob On Books“. His “On Youngstown” series highlights different aspects of working class Youngstown. Yesterday’s article was about the different family owned grocery stores that he often visited as a child. As a product of Youngstown in the 1980’s and 1990’s, my grocery store visits were usually to chain stores including Giant Eagle in Liberty or the Sparkle Market on Gypsy Lane. I have only a few memories of visits to the Pyatt Street Market or the A&P on Elm Street. Historically, however, my maternal family has a history of operating groceries. My great great grandfather Joseph F. Witt operated a grocery at 413 Ford Avenue on Youngstown’s north side. His brother John A. Witt operated a grocery at 1001 Blackadore Avenue in Pittsburgh. The photo above is of Joseph in his store at sometime in the 1930’s. Canned goods, tobacco, fresh vegetables and even Hostess cakes are visible in the picture. Grandpa Joe passed away in 1943. Today the 400 block of Ford Avenue is vacant, with his store long gone and a Youngstown State parking lot nearby. 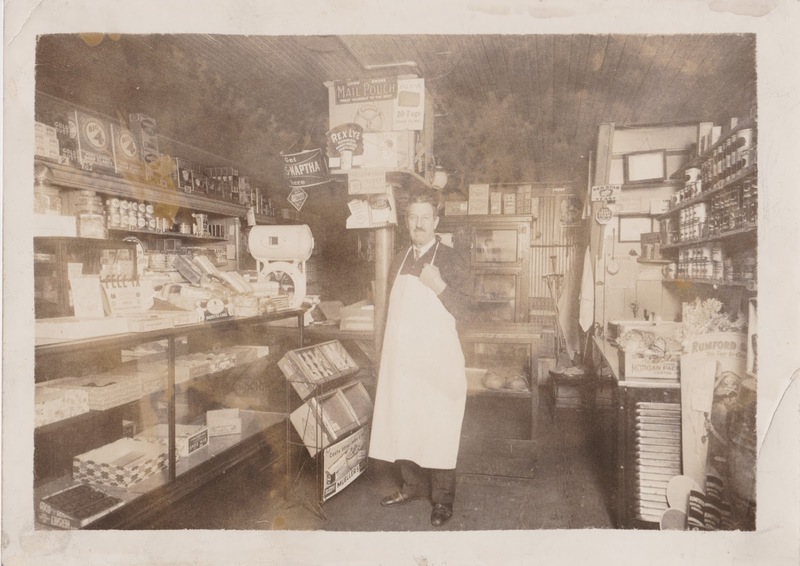 Joseph Franklin Witt (1868-1943), photograph, taken in Witt’s grocery at 413 Ford Avenue in Youngstown, Ohio in the 1930’s; image taken by unknown photographer; privately held by Joseph Lowry, [address for private use], Sterling, VA. Provenance is Mary Catherine Witt Sanders to Joseph Lowry. You would be hard pressed to find 337 Rebecca Street in Pittsburgh today. It simply doesn’t exist, but it did exist in 1910 and that is where my 3rd great grandparents Martin and Elizabeth Witt made their home. Rebecca Street in the North Shore neighborhood is today known as Reedsdale Street, but now it is just a series of short segments cut by Highway Route 65 and Heinz Field, home of the Pittsburgh Steelers. 79-year-old Martin, born in Germany, was a grocer while 70-year-old Elizabeth kept the house. She was born in Pennsylvania to German parents. Martin and Elizabeth celebrated their 50th wedding anniversary the year prior, as the census sheet indicates they had been married for 51 years. Elizabeth gave birth to 13 children, 8 of whom were still alive in 1910. Witt, Martin, head, male, white, 79 years old, 1st marriage, married 51 years. Born in Germany. Father born in Germany. Mother born in Germany. Immigrated in 1831. Naturalized citizen. Speaks English. Employed as a clerk in a grocery. Is not out of work; out of work 10 weeks in prior year. Can read: Yes. Can write: Yes. ” Elizabeth, wife, female, white, 70 years old, 1st marriage, married 51 years. 13 children born, 8 still living. Born in Pennsylvania. Father born in Germany. Mother born in Germany. Not employed. Can read: Yes. Can write: Yes. 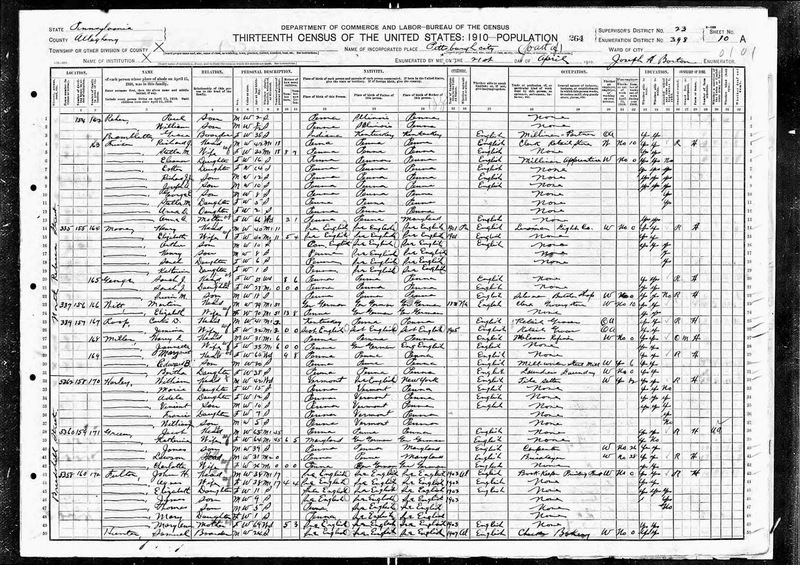 1910 U.S. Federal Census, Allegheny County, Pittsburgh, population schedule, Enumeration District 398, Sheet 10, Dwelling 337,. Martin Witt; digital image, Ancestry.com (http://www.ancestry.com : accessed 7 Jun 2015): FHL microfilm: 1375315. National Archives microfilm publication Roll T624_1302. I’m going to get back into the swing of posting here, I promise. I actually enjoy sharing my family discoveries and have been quite active in my genealogy work. I just haven’t been posting anything to the blog. I hope to change that in the coming days and weeks. You can certainly expect some great daily photos in the very near future. Mary Catherine Sanders (nee Witt) provided me some amazing photos of my 2nd great grandfather and his family that I can’t wait to scan and share. I’ve also made some discoveries involving Civil War records and closed a very big loop regarding Edward Lowry, my 2nd great grand uncle from Washington state. So stay tuned, there’s more to come! Today’s photo of the day is the wedding photo of John Albert Witt and Johanna Thaner. They were married on 22 May 1890 in Saint Mary’s Church in Pittsburgh. John is the brother of my 2nd great-grandfather Joseph Witt. I’ve written about John’s unfortunate death here. John Albert Witt (1863-1942) and Johanna Thaner Witt (1862-1949), photograph, taken in Pittsburgh, Pennsylvania on 22 May 1890; digital image, photocopy of original, scanned by Mary Mathewson; privately held by Mary Mathewson, [address for private use], Rocky River, Ohio. 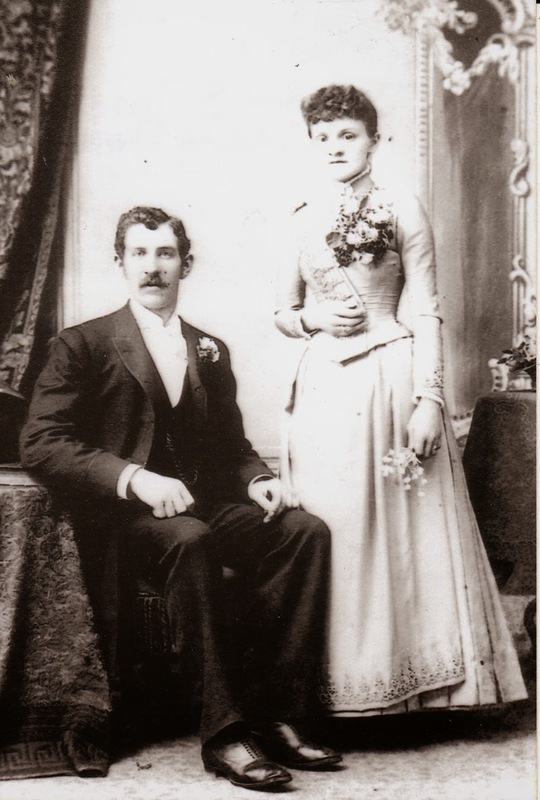 Man seated in suit and woman standing in wedding gown. Provenance is Mary Mathewson to Joseph Lowry. My sister Caroline had to be only a few weeks old when this photo was taken in June 1983. 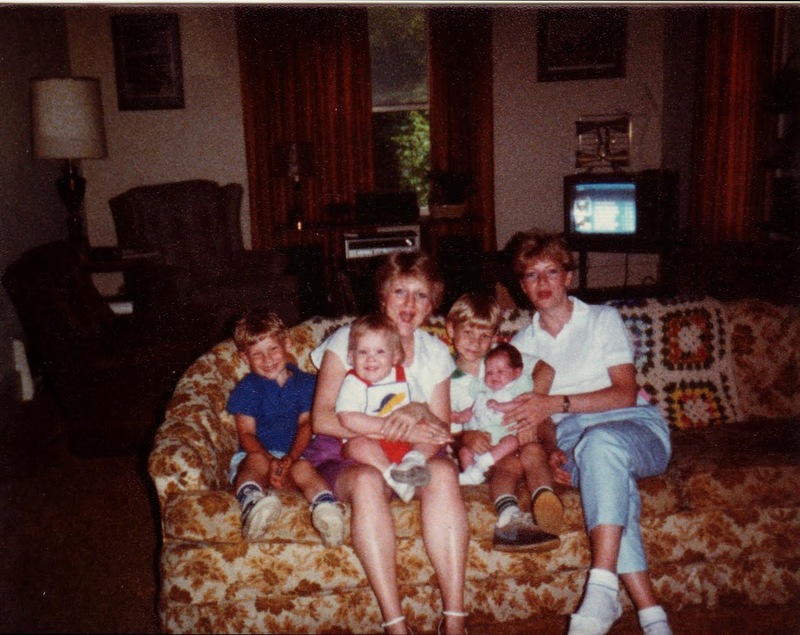 I believe this was my Witt grandparents’ living room at 330 Fairgreen Avenue in Youngstown. My mom is holding me while my cousin Jacob Sofranko holds Caroline. John Sofranko is to the left of my mom and their mother (and my godmother) Julie Sofranko is on the right. John Sofranko, Joseph Lowry, Rebecca Witt Lowry, Jacob Sofranko, Caroline Lowry, Julie Sofranko, photograph, taken on Fairgreen Avenue, in about 1983; digital image, photocopy of original, scanned in 2013 by Joseph Lowry; privately held by Rebecca Lowry, [address for private use], Poland, Ohio. Two mothers surrounded by four children. Provenance is Rebecca Lowry to Joseph Lowry.